A lifetime ago, in 1974 when I first started teaching, nothing happened without chalk and a blackboard. You can just imagine the excitement when colored chalk started hitting the shelves. Then, in the 1980s, we celebrated the introduction of the overhead projector. We learned to live with rainbow-colored hands as the price we paid for having to recycle transparency sheets. Less than ten years ago, an ELMO appeared in my classroom. No, not the Sesame Street character. An electronic visual presenter that let me show anything, anytime, anywhere just by popping it under the lamp. And just when I thought I’d reached teacher heaven, along came the SMART board to push me right past the pearly gates. People choose the SMART Board interactive whiteboard because it helps energize presentations and motivate learners. In 1991, it was the world’s first interactive whiteboard. Today, it is the world’s leading interactive whiteboard. Combining the simplicity of a whiteboard with the power of a computer, the SMART Board interactive whiteboard engages students and audiences around the world. The touch-sensitive display connects to your computer and digital projector to show your computer image. You can then control computer applications directly from the display, write notes in digital ink and save your work to share later. Best of all, the full-featured SMART Board interactive whiteboard is incredibly easy to use. If you can use a computer, you can use a SMART Board interactive whiteboard. It revolutionized the way I teach writing, and the kids are totally engaged when I use it. And now, this truly smart SMART group is making it possible for teachers who don’t have a board to win one. • The Parent’s Toolkit gives tips to those parents who want to raise money so they can get a SMART Board interactive whiteboard for their school. • Enter the contest and share in the discussion! I have been teaching over twenty years. This has never happened. And if it never happens again, this one time will be with me for always. This is a thank you from a former student. You have changed my life and I will never forget it. Thank you for giving me confidence and the most inspiring English lessons. You are an amazing woman, and I hope the best for you and your family. I hope to see many more Allan books for me to keep reading. THANK YOU! From: One of the many lives you changed. If you’re the person who sent these, I hope you read this or find your way here from Facebook or Twitter. Not that you expected gratitude or recognition; otherwise, you would have signed your name. That you didn’t makes this act of kindness all the more remarkable and powerful. Thank you. God bless you. In the process of writing her second book for Simon & Schuster,Stacy DeBroff interviewed over 250 teachers. One of the interview topics concerned the most meaningful moments they had experienced in their careers, and the majority of teachers expressed that feeling appreciated meant more than any tangible gift they could have received. My experience truly reflects what Stacy found in her interviews because even though I received a tangible gift of flowers, the truth is the note itself was gift enough. Sometimes, parents and students aren’t sure how to convey their appreciation or, perhaps, like my student, would prefer to do so anonymously. Bing is encouraging students and parents to recognize teachers who have made a difference in their lives through a new philanthropic campaign focused on supporting kids’ education. Bing has committed to a gift of up to $500,000 and teamed up with DonorsChoose.org to provide both kids and adults with a way to express their thanks to a teacher and help another teacher or school in the process. Visit www.bing.com/education to post a comment or share a story about a teacher who made a difference in your life (or the life of your child), and Bing will provide you with a $5 donation to DonorsChoose.org, which can be applied toward any classroom project of your choice. I’ve posted a project on DonorsChoose for our ONE SCHOOL, ONE BOOK literacy initiative next year. Bing’s Teacher Appreciation Website helps teachers help themsel ves. Here’s how it works: a teacher can log onto the DonorsChoose.org website to start a “classroom project” or donation request. Parents and students can then visit the Bing Teacher Appreciation site to leave a comment [up to 5 per visitor] about a teacher who has made a difference in their life, enabling them to receive a $5 giving code to donorschoose.org [one per comment]. Parents and students can then apply the $5 giving code to the “classroom project” of their choice. One of my daughters, Sarah, who had Down’s Syndrome, was blessed to have a teacher, Mrs. Hebert, whose enthusiasm and passion were gifts to her students and to us as parents.She never patronized her students; in fact, she challenged them to become productive and engaging members of society. I’ll always appreciate her for that, and Bing is giving me a way to recognize her. Each visitor can leave up to 5 comments, resulting in a total donation of $25. At the end of June, Bing will aggregate the comments and share them with each teacher in the form of a congratulations letter. Go ahead. Make a teacher’s day! MAMA PhD…no womb at the university? This book is a must-have for any woman who intends to pursue motherhood and academics. In truth, it should be required reading IN the universities for everyone–male and female–in education. My first child, my son, is now 31, with two daughters of his own, and I still remember arriving at school in the mornings looking like a raccoon, mascara puddling on my eyelids, the wet sorrow of peeling myself away from him. This book is one I’m ordering copies of for my own daughters, not because they’re mommy/academics, but because the stories of the struggles are honest and funny. They’re written by women who know that sometimes the solution is equally problematic, but who recognize that balance is a goal…not a given. 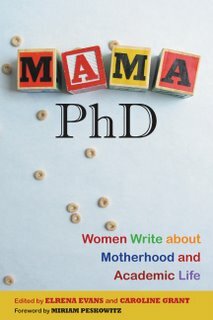 Mama, Ph.D. is a literary anthology of deeply-felt personal narratives by women both in and out of th e academy, writing about their experiences attempting to reconcile bodies with brains. This anthology voices stories of academic women choosing to have, not have, or delay children. The essays in this anthology will speak to and offer support for any woman attempting to combine work and family, and will make recommendations on how to make the academy a more family-friendly workplace. Caroline and Elrena decided to assemble this collection because it’s the book we needed when we entered graduate school and the academic job market. We wanted to know that blending family life with life in the ivory tower might be possible; we needed to know that other women were attempting this balancing act. Those women were invisible to us then, but as we began to seek out their stories, we discovered so many women living out this very challenge. We want their stories to be told, so that other women who face these difficult choices will know that they are not alone. We hope this book will encourage and inspire these women, as they try to decide if, when, and how to balance motherhood and academic work. Our stories will be told more fully in the book, but for now, here’s a brief look at our backgrounds. Caroline, an editor and columnist for Literary Mama, got married six weeks after earning her Ph.D, and got pregnant, two years later, the same week as finally landing a good teaching job. She thought she might attempt to balance teaching and motherhood, but over the course of her pregnancy and brief maternity leave realized that she needed to leave academia. Elrena (a contributor to Literary Mama and other publications) found out she was expecting during her second semester of Ph.D. studies, but her plans to sail blithely through her pregnancy while continuing her studies were radically altered by serious pregnancy complications. After trying to balance recovery, new motherhood, and graduate student life for a semester, she realized she needed to take a year off and rethink her commitment to the academy. Caroline and Elrena, having both left the confines of the ivory tower, are now working on this book. As graduate students in a rigorous PhD program, we often marveled at the professors raising young children amid the intense demands of academia. Such conversations took place in private, however, as anything outside of publishing and landing a job was considered frivolous for serious doctoral candidates. We all had babies within the first few years of joining faculties (at a state college, a community college, a private university, and a state university, respectively) and found that sharing our unsettling Dr. Mom experiences in phone conversations, e-mails, or the occasional meeting helped us to process the multifaceted challenges faced by the academic mother. 1 The medieval structures and traditionally juvenile attitudes toward women in the higher education system have not been completely dislodged; they just appear in more covert but equally insidious ways. Motherhood is constructed as All Body—our own and/or our baby’s—while scholarly work is rendered All Mind. This is an impossible theoretical dialectic to negotiate, and establishing realistic expectations is crucial for anyone considering (or reflecting upon) maternity in light of myriad obstacles erected by academic culture. We hope the following list might be useful in that regard. 1. You are strong enough to handle any disturbing assumption regarding maternity before, during, and after your pregnancy—know that it reveals more about the system than it does about you. People may assume all you want to talk about (or are capable of talking about) is your child. In meeting after meeting, the dean would ask other colleagues about their writing projects while she just asked me, “How’s the baby?” I felt like she assumed that I was no longer in the same professional realm; I was (only) a mother. When I told my chair that I was pregnant, the response was, “You do know how that happens, don’t you?” While I was reeling from that, he said, “Oh, I thought you were going to tell me that you’d gotten a job at Cornell”—so I felt troublesome in having become pregnant and also less acceptable for only having become pregnant, rather than landing a prestigious job. 2. You are maternally beautiful, even if you feel more like a spectacle than at any other time in your life. Your expectant body will be inscribed by colleagues, students, friends, and family. Those notations may seem disparaging or embarrassing even when they probably aren’t. It was difficult not to feel self-conscious standing in front of classes with my belly bursting out of whatever ridiculous ensemble I’d created in an earnest effort to look polished (“Do you think they’d notice I’m enormous if I add this scarf?”). Simply acquiring a professional maternity wardrobe can be hard on a junior faculty or adjunct salary; you might try eBay, where postpartum women often sell gently used work clothes in lots, and baby-oriented consignment stores. how to ROCK YOUR CHILD’S SCHOOL and not be arrested for vandalism! If you’re a parent of a student in any grade from kindergarten through eighth, this is your opportunity to rally the PTA and win prizes for the school, the top one being a concert PLUS the box tops. Look over the list at the end of this post, I’m sure some of the products there may already be in your house. The Kimberly-Clark Rock Your School Sweepstakes is easy to enter! All you have to do is register and then you can enter daily, through September 15, 2008, for your chance to win. There are two ways you can enter: By mail or on the Internet at RockBackToSchool.com. The information you provide when you register will be used to contact you if you are a winner. Remember, you can enter once a day, every day. You can enter the Kimberly-Clark Rock Your School Sweepstakes once a day, every day, through September 15, 2008. The winners will be chosen on or around September 22nd and notified shortly thereafter. One lucky winner will receive the grand prize of a concert with Radio Disney Star Jordan Pruitt at their child’s school, plus 100,000 Bonus Box Tops! That’s not the only thing we’re giving away though. 100 winners will receive 1,000 Bonus Box Tops (that’s a value of $100!) for their child’s school, 200 winners will receive an autographed Jordan Pruitt CD and 1,000 winners will receive a non-autographed Jordan Pruitt CD. Good luck! Box Tops for Education has helped America’s schools earn over $200 million since 1996! In fact, Kimberly-Clark has donated over $4 million to schools just in the past year through its partnership with Box Tops. Well, if you learned you didn’t learn anything, wasn’t that learning? Too many students measure learning using the following formula: student + worksheet = work of consequence. Sad. How did that happen? During my brief twenty years of educating high school students, I’ve learned that the most significant learning can be purely accidental. The learning that catches you by surprise years later when an event triggers some memory, for example, and my “you have to know what to do when you don’t know what to do” suddenly makes sense. Maybe in the yawning midst of the lesson on uses of semi-colons, there’s the lesson in perseverance or patience or possibilities. I’d like to pat my own back for that particular “accidental” learning, butI can’t. Actually, my role is to provide the opportunity for the serendipity, not to provide the moment it happens.